Registration for classes can by done by telephone, in person, or by downloading and printing the registration form below and sending it with a personal check. (Note- As most classes fill up quickly, it is best to call or e-mail first to find out about availability). Students must be 18 years old or older. The Connecticut Valley School of Woodworking reserves the right to use any photographs taken during classes for promotional purposes. Single day or weekend classes Payment in full is required at time of registration. Materials charge is due at beginning of class. Week-long classes A minimum deposit of $250.00 is required at time of registration. Balance of tuition & any materials charge is due the first day of class. Refunds If you withdraw from a class * more than one week in advance we will refund your payment or apply it to another class. 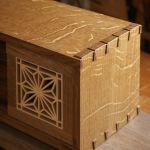 Cancellations If The Connecticut Valley School of Woodworking cancels a class for any reason we will issue a prompt refund or apply your payment to a future class if you prefer. Guidelines Upon registration you will be given a copy of the school guidelines, tool list and general release. Please return signed release before the class begins. Lodging A listing of local motels and rates is available. We are not responsible if the rates are changed.